Geriatric Strength Training and Movement Re-education for Mobility is a two-day interactive seminar designed to enhance the ability of clinicians to treat older patients with various disease processes in improving mobility, including gait. The medical complexity of the typical geriatric patient can complicate the rehabilitation process. Regardless of diagnoses, a common deficit seen in all geriatric patients is weakness that can be linked to functional decline. 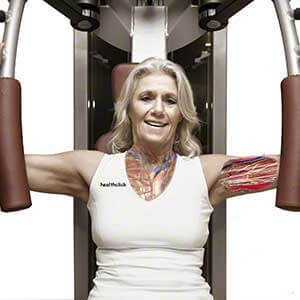 Muscular weakness can be successfully treated with specific prescribed exercises. The participant will leave this course with progressive, safe, and a thorough understanding of evidence-based approaches to optimal functional strength building and mobility improvement for geriatrics. Traditionally, rehabilitation has focused on isolating and training muscles using single planes of motion. Muscles and joints do not work in isolation. We know that functional activities like transfers and gait are triplanar and require acceleration, deceleration, and dynamic stabilization. This course will emphasize training movements, not muscles. Participants will develop an evaluation process and learn tests that allow assessment of kinetic chain movement patterns to detect quality of movement and neuromuscular efficiency. One such test, named the Overhead Squat Test, assesses the closed kinetic chain mobility and stability of patients ankles, knees, hips, core, thorax and shoulders during a fundamental movement pattern. Mobility and gait also utilize basic fundamental movement patterns that will be assessed/corrected. Based on movement pattern findings and applying neuromuscular physiology, the participant will learn to inhibit and lengthen specific overactive muscles, facilitate under active muscles and prescribe corrective exercises utilizing evidence-based, optimal strength training parameters. Attendance at this course will immediately increase clinical skill in obtaining positive functional outcomes in an efficient manner in all settings of geriatric practice. Discuss evidence-based practice including the classic studies regarding geriatric strength training and how they relate to the population we treat. Identify and discuss optimal resistance training parameters such as progressive resistive exercises, intensity, frequency, sets, and repetitions. Correlate strength (underlying) impairment to functional deficits and converse with therapy team regarding functional strengthening as it relates to goal achievement. Describe the scientific and clinical rationale behind the development of an exercise program for the treatment of mobility in the geriatric population. Perform functional movement assessments such as the overhead squat test, mobility and gait to identify weaknesses in the kinetic chain. Prescribe corrective exercises to treat functional deficits in mobility. Properly utilize functional strength tests like bridging, SLR, Trendelenburg, and upright motor control test. Identify movement training principles and how to activate movement/motor patterns.